A new vegan Italian restaurant, Pura Vita, has opened in West Hollywood. Chef/owner Tara Punzone (Real Food Daily) reaches to her Italian heritage to create a menu featuring Calabrian eggplant stew, lasagna with black truffle cream, spinach, ricotta, mushroom, béchamel and pesto, and various pasta dishes with ingredients sourced from Italy and local farmer’s markets. The wine bar offers a 40-bottle list of Italian vegan, all-natural, biodynamic wine. Pura Vita, 8274 Santa Monica Blvd., West Hollywood, CA 90046, 323-688-2303. Prolific restaurateur Michael Cardenas (Sushi Roku, Lazy Ox) has opened Mister O’s in Studio City. Chef Mario Alberto (Lazy Ox, Ysabel) creates bright, “modern Angeleno cuisine” with light dishes like avocado with salt cod and lemon balm or fried turmeric bread with tiger figs, olives, farmer’s cheese and honey; mains run from sea bass with chanterelles and corn to lamb loin with sunchokes and côte de boeuf. The bar program from Rafael Jonathan Barba (The Restaurant at Meadowood) is sophisticated, and the wine and beer lists are compelling. The airy, mid-century styled dining room and lounge have an elegantly casual California vibe. Dinner nightly. Mister O’s, 11838 Ventura Blvd., Studio City, CA 91604, 818-358-3839. Night + Market Sahm in Venice is now serving lunch Wednesday through Friday. Look for chef Kris Yenbamroong’s versions of a spicy fried chicken sandwich, crispy rice salad, curried noodles, pad thai and crab fried rice. Night + Market Sahm, 2533 Lincoln Blvd., Venice, CA 90291, 310-301-0333. 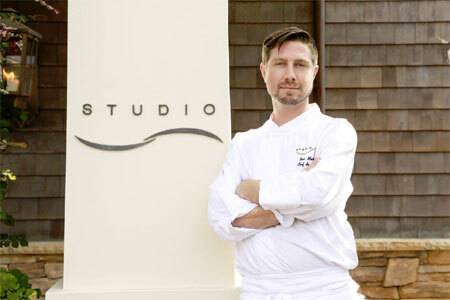 Montage Laguna Beach has promoted Benjamin Martinek to chef de cuisine of Studio, its flagship restaurant overlooking the Pacific Ocean. He has been part of the resort's culinary team for seven years, most recently as sous chef at Studio and before that as an executive sous chef at The Loft. Martinek takes over from executive chef Craig Strong, who is opening his own restaurant, Ocean at Main, in Laguna Beach. Studio, Montage Laguna Beach, 30801 S. Coast Hwy., Laguna Beach, CA 92651, 949-715-6030. The lovely Chaya Downtown has closed on Flower Street after nine years. CHAYA Modern Izakaya in Venice remains open. Chaya Downtown, 525 S. Flower St., Los Angeles, CA 90071, no phone.